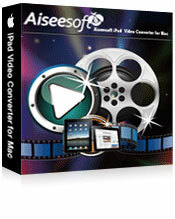 Aiseesoft iPad Video Converter for Mac makes your iPad a powerful container for your favored movies and music with great capability to convert almost all the popular video and audio formats such as MPG, MPEG, MPEG2, VOB, MP4, M4V, RM, RMVB, WMV, ASF, MKV, TS, MPV, AVI, 3GP, 3G2, FLV, MPV, MOD, TOD and HD video to iPad supported video/audio format. 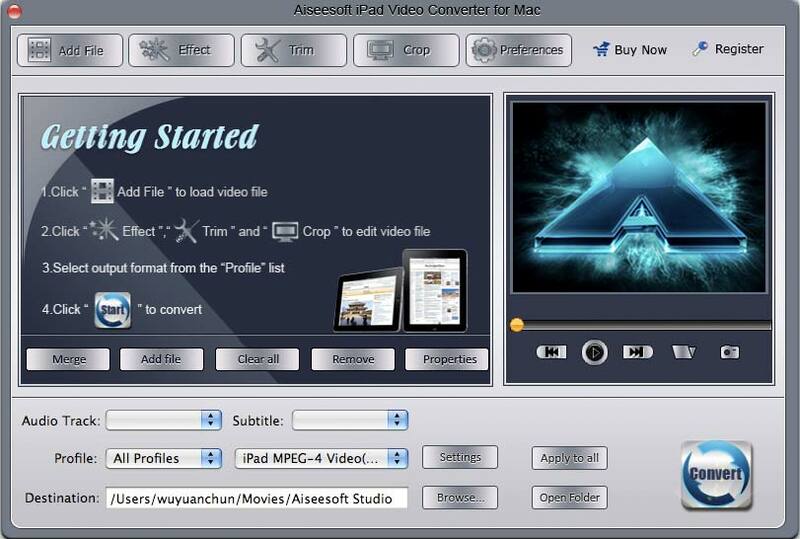 What's more, Aiseesoft iPad Video Converter for Mac also enables you to pick up any part of the video you like, adjust the output video effect, crop the video, watermark video, and adjust the aspect ratio. Convert AVCHD (*.mts, *.m2ts), H.264/MPEG-4 AVC, MPEG-2 HD, MPEG-4 TS HD, MPEG-2 TS HD, Quick Time HD, WMV HD, AVI HD format and etc to iPad 720p H.264 HD, H.264, MPEG-4 video formats. Convert popular video format such as AVI, MPEG, WMV, DivX, MP4, MOV, RM, RMVB, ASF and 3GP to iPad video formats H.264/MPEG-4. More functions are available to meet multiple requirements, such as Trim, Crop, and Merge into one file, Watermark video, select your preferred audio track and subtitle, etc. Just one source, you are enabled to convert it to different formats in one operation to save your time and trouble. With the best Mac iPad converter, you can create iPad videos for iPad, iPod nano 4, iPod touch, iPod touch 2, iPod classic, iPod shuffle, iPhone, iPhone 3GS, iPhone 4. Q: How do I make my backup in a good order? A: You can click "Search" button. Aiseesoft iPad Manager for Mac classily your songs and video into "Grene", "Artist" and "Album" 3 classes. Copyright © 2014 Aiseesoft Studio. All rights reserved.